Bisbee Turquoise is some of the rarest and finest Turquoise to ever be mined. Bisbee Turquoise cabochons can be found in the finest Turquoise Jewelry in the world and Bisbee Turquoise cabochons are sought after by every fine jeweler and collector world wide. Bisbee Turquoise cabochons are cut out of Turquoise rough that was mined in the “Lavendar pit” in the Copper Queen mine in Bisbee, Arizona USA. Rough Bisbee Turquoise is almost impossible to come by and can only be purchased from individuals that have old stashes or collections from when the Bisbee Turquoise mine was in production. T`he rough Turquoise from the mine is perfect for cutting Bisbee Turquoise cabochons as it is some of the hardest Turquoise in the world. 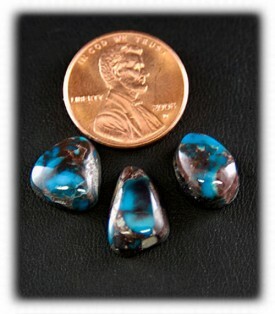 The color of these Bisbee Turquoise cabochons is a true blue for the most part. Having said that there was material that came from the mine that produced green and aqua blue Bisbee Turquoise cabochons. Ever since the openning of the Bisbee Turquoise mine Bisbee Turquoise cabochons have been highly sought after and have always had a high price tag associated with them. Bisbee Turquoise cabochons retain a higher price tag due to the color, hardness and beauty of the matrix or host rock that Bisbee Turquoise has. The Bisbee Turquoise mine was one of the only Turquoise mines to produce a majority of gem grade Turquoise, rather than chalk. Most of the Arizona Turquoise mines produce more Chalk Turquoise than gem grade Turquoise. This is a major reason that Bisbee Turquoise is so desireable, a long with the fact that Bisbee Turquoise Cabochons are some of the only Turquoise cabochons in the world to have a deep blue color naturally. Most Turquoise has to be stabilized and Enhanced to acheive the deep blue colors that high grade natural Bisbee Turquoise cabochons have. During the Turquoise boom of the 1950s through the 1980s jewelers could not obtain Bisbee Turquoise cabochons unless they had an in with the miners. Bisbee Turquoise has always been the cream of the crop and even during the Turquoise boom when other Turquoise brought 50 cents to a dollar a carat, Bisbee Turquoise would bring a dollar a carat to 15 dollars a carat! 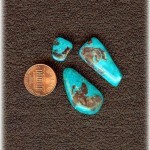 Today a quality Bisbee Turquoise cabochon can be purchase for 5 dollars a carat up to 300 dollars a carat! Bisbee Turquoise Cabochons By Durango Silver Co.
Durango Silver Company started cutting Bisbee Turquoise Cabochons when John, Dillon and Estell Hartman purchased the Cecil Mickelson / Bob Matthews collection. This collection included over 300 lbs of Bisbee Turquoise rough, Bisbee Turquoise cabochons as well as lapidary equipment. Cecil Mickelson was the proprieter of Mickelson Jewelry Co. and the brother-in-law of Bob Matthews who was the only person to ever have the rights to the Bisbee Turquoise that came from the Lavendar pit in the Copper Queen mine in Bisbee, Arizona USA. 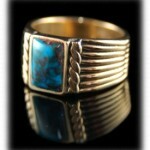 Mickelson’s Jewelry Co. specialized in Bisbee Turquoise Jewelry. 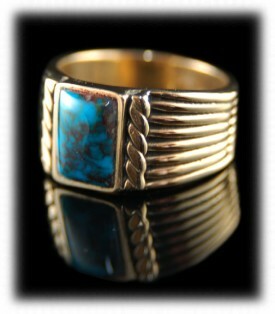 Now Durango Silver Co. specializes in Bisbee Turquoise Jewelry and Bisbee Turquoise Cabochons. Durango Silver Company recently purchased a new old stash collection of natural Bisbee Turquoise that they will be cutting into Bisbee Turquoise cabochons and Bisbee Turquoise Jewelry. Keep your eyes peeled. Bisbee Turquoise has been mine and cut by modern humans since the 1920s. 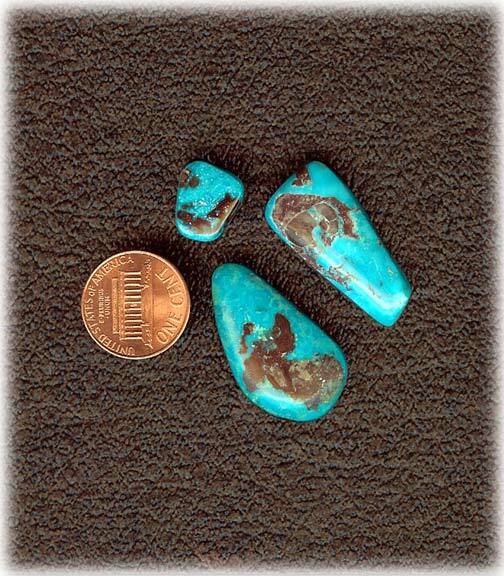 There is evidence to believe Bisbee Turquoise cabochons were cut by the Anasazi Indians. Vintage Bisbee Turquoise do not always look as good due to the style of the times. Many Turquoise cabochons were cut in the “Nugget cut” where the turquoise nuggets were simply polished off enough to reveal the color. Also, during the turquoise boom many artists and stone cutters could sell as many Turquoise cabochons, especially Bisbee Turquoise cabochons, and Turquoise jewelry as they could make, therefor, they did not take the time to cut the cabochons as nicely as they do today. There are sure to be many vintage Bisbee Turquoise cabochons out there that could be re-cut into an AAA grade Bisbee Turquoise cabochon. Thank you for learning about Bisbee Turquoise Cabochons. 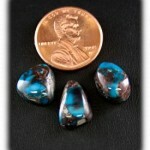 View Bisbee Turquoise Cabochons for sale and possibly find that Bisbee Turquoise cabochon for you.